I know there have been thousands of blog-posts on the topic already and I am certainly not going to write anything new here. But being itched to write on something and not getting a chance to do so has compelled me to do my 'bit'! 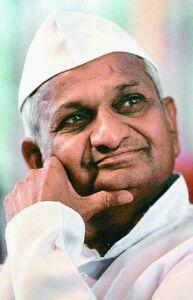 Anna Hazare....a man who completed my wish of living pre-1947 and being a part of India...I mean a true part! He who compelled me to think beyond office, friends, relatives, facebook...and even World Cup! He who gave me the honour of watching the history being created! He who told me that the citizenship to a country doesn't only mean a Passport or Voter ID card. What he did doesn't need to be reminded. On the contrary, it would be unforgettable for hundreds of generations ahead. What needs to be reminded is...a 71-year old man is bearing the weight of 1,155,347,678 people out of which 40% is us...the youth! Shame on us that a man who gave us independence 64 years ago has again taken the initiative of gifting us freedom.